Asher’s Hair Journey & A Product Review! Lord knows I have struggled with this child’s hair FOR MONTHS NOW! I absolutely love his big, beautiful, luscious, tight curls so much. I have been having such difficulty trying to detangle it and finding products that work with his hair type. I felt like nothing was working for more than a day or two. The back of his hair was usually flat, dry, matted and basically just dreaded up. I am embarrassed to admit this but I haven’t properly detangled his hair in such a long time, I totally paid the price! I would just wash his hair, slather it in products, shape it and call it a day, that had become the new routine. After doing that for a couple of months it finally caught up to us. * This is what the back of his head would look like after a while of neglecting to detangle/shape it. I would have to overload on products just to attempt to bring it back to life, but it was still always like this otherwise. I started to realize that the reason his hair couldn’t retain the proper amount of moisture was because of how tangled and knotted it was. It felt like no matter what I put on it, nothing changed. I was at my wits end, I didn’t even know where to start. I finally talked my husband into getting Asher his first trim at the barber shop. I thought that if we just trimmed the ends maybe it would be easier to get through. I was just desperate. I honestly considered cutting his hair myself, but after failing epically when I cut my own, I decided not to lol. My hubs was so against cutting his hair though, he decided to tackle it himself! He would try to detangle it and style it with products. One night he was giving Asher a bath, I went to check on them and I saw him in the tub with Asher detangling his hair. That was hands down my favorite dad moment, probably ever haha. Then there was the time he took Asher outside to play in the kiddie pool, he grabbed the hair products and started to detangle it again since Asher was distracted. There were countless times that he would try to detangle and style Asher’s hair before we would go out. There was just too much of it that was matted up, we could never finish in the time Asher gave us. Stephen was just so determined to keep Asher’s hair, I just couldn’t let him down. Prior to things getting as bad as it did, my mom had been a great resource. I was able to tackle Asher’s hair and have it braided in cornrows. She would do half of his hair and I would do the other. We would use a detangling spray from So Cozy after leaving conditioner in his hair to soften it up. But at this point, I started to confuse his natural hair type because the texture felt different in the back than it was in the front. I started to think he had combination hair. I thought he had his daddy’s hair in the front and mine in the back lol. My mom kept trying to convince me that that wasn’t the case and that it just needed to be treated properly. I was just so convinced otherwise… now why didn’t I just listen to my mama? It would have saved me from hours of research haha. After realizing that she was right, I still didn’t know what to do. I wanted to use the method we did prior, but I couldn’t. The only issue now was that his hair was worse and I knew I was going to need something quick and effective. The last thing I needed was for him to start dreading wash day. After feeling completely lost, I realized that I was going to need a mom tribe to help me out! I ended up joining a few mom groups/forums related to natural hair. I posted about the issues I was experiencing with Asher’s hair in hopes that I would get a few suggestions. I was so unbelievably surprised by how much help and kindness I was met with. I got so many amazing suggestions in relations to routines that I should start implementing and what protective styles I could do. I also found out that they sell little baby satin bonnets for kids to sleep in on Amazon.com & Etsy, I mean how cute is that!! Then I stumbled upon the HOLY GRAIL! I was told about a product from the brand Aunt Jacki’s called “Knot On My Watch, Instant Detangling Therapy”. The mom who told me about this posted a "before and after" picture of her son’s hair with it and I was a believer. It was basically LIQUID GOLD! I read so many reviews online and I watched countless videos of people using this (I should add that whenever I am going to try anything new on Asher I research the hell out of it first LOL, I spend too much time worrying otherwise haha). Anyways this product literally melted the knots right out of his hair! I couldn’t believe my eyes, it went from dreads back to his luscious curls! Now, this is truly an amazing product and I can’t say enough good things about it, but Asher’s hair did take time to detangle. To no fault of the product, I did spend quite some time trying to get through all of his hair. There was just so much and I really wanted to be extremely thorough. Below I have written out the steps that I took to detangle his hair! Next, I sectioned his hair into about 6 sections and used a hair elastic to secure each section in place. Then I added Almond oil to all of his hair for more slip. I was just paranoid about it not working so I was adding it in to insure the softness would remain. After I had finger-detangled it and got the knots out, I went back to detangle it with a comb. The comb would literally slide right through his hair! When it was nice and smooth I twisted it and moved on to another section. It made his hair SO SOFT, it was easy to just loosen the knots and get them out. Let me just tell you, this whole process worked like a charm and I will DEFINITELY be buying this product again! It was nice to see how long his hair had gotten. 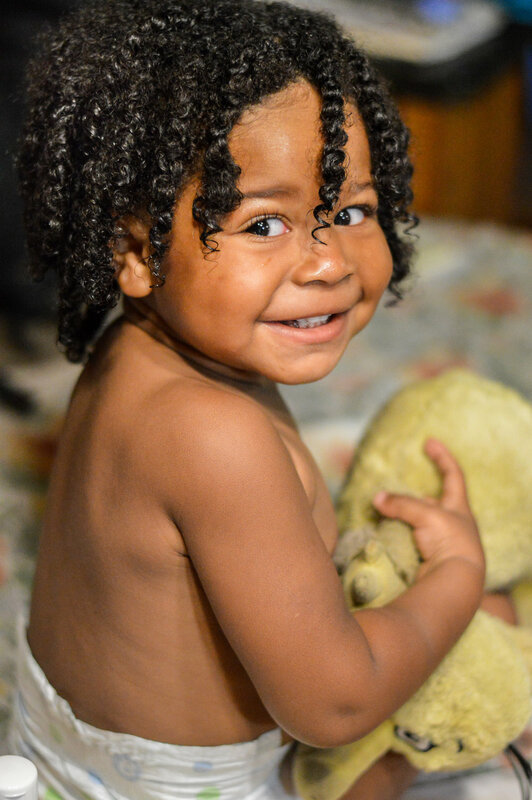 It is usually in a big afro so it’s a little hard to tell, but the twists stretched out his hair and we were pretty surprised haha. Also, shout out to Asher for being the sweetest and most patient baby, it took FOREVER and he was tired and so over it by the end, but he stuck it out with me and it was so worth it. 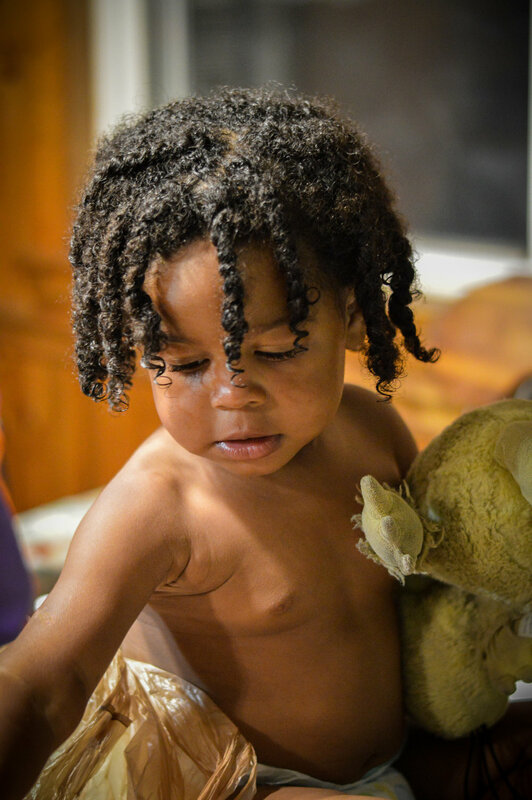 This journey has been so important to me because I want Asher to love his hair and fully embrace his culture. I don’t ever want him feeling out of place because he looks different or have him feel insecure about it. Diversity is so beautiful and it starts by embracing our authentic selves. I have had my own personal conflicts about my hair when I first started my journey. One of the things that really kept me going was knowing that there may come a time when my children face these same issues and I would think to myself, “If I can’t be true to myself in the most unapologetic way, then how can I teach them to be?”. Representation matters, and it starts at home. Again, thank you to all the moms who stopped my panic and embraced this journey with me.